It was a good year to be a promotional products distributor. According to our data, the 2018 Top 50 totaled $5.033 billion in promotional products sales in 2017, up more than $500 million from our previous list's $4.476 billion tally. While much of that comes from two new additions—Taylor Communications ($238 million) and Discountmugs.com ($210 million)—that $5.033 billion total would be even higher if it included sales figures for Staples Promotional Products, National Pen Company (now part of Cimpress), Cintas and other top distributors that declined to report their earnings to us directly. And the gains weren't limited to the newcomers. Of the 44 distributors on this year's list that also appeared on last year's edition, 37 saw increased promotional products revenue from 2016 to 2017. And some distributors reported massive gains. HALO Branded Solutions, on the back of a few strategic acquisitions, increased its promotional products sales 47 percent, jumping from No. 4 last year to No. 2 this year. BDA LLC, which made two acquisitions in 2017, increased sales 22 percent, finishing at No. 4 on our list. Meanwhile, 4imprint (12.5 percent) and American Solutions for Business (11 percent), both also in the top 10, reported double-digit percentage increases. The biggest increase, though, belonged to BAMKO LLC, whose December 2017 acquisition of Tangerine Promotions (No. 27 on our 2017 list) contributed to a 99 percent rise in sales, from $42.1 million to $83.7 million. It was enough to take BAMKO from No. 32 last year to No. 17 this year, a jump topped by only one distributor, APISOURCE Inc. After placing just outside the 2017 Top 50 (No. 52), APISOURCE ranked No. 31 this year—a 21-spot jump. Want to see where everyone else ranked? 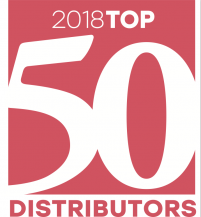 Click here for the full 2018 Top 50 Distributors list. In the meantime, here are some other fun stats and trends we saw in our analysis. Let us know if we missed any others. • In total, 11 distributors rose five or more spots from 2017 to 2018. Aside from BAMKO and APISOURCE (both mentioned above), The Image Group made the biggest jump of any promotional products distributor, thanks in part to its merger with Target Marketing. Separately, the two distributors ranked No. 51 and No. 55 in 2017—both narrowly missing the Top 50 cutoff. Combined, the single entity placed No. 38 this year, a 13-spot rise. Image Source, which also missed the Top 50 cutoff and finished No. 58 in 2017, also had an impressive 11-spot rise to No. 47 this year. Other notable risers include BrandVia Alliance (No. 31 to No. 23), Quality Logo Products (No. 34 to No. 29), Chamberlain Marketing Group (No. 35 to No. 30) and Touchstone Merchandise Group LLC (No. 40 to No. 33). • Total promotional products revenue for all unranked distributors (companies that submitted revenue figures but did not make the Top 50) with individual sales greater than $100,000 was $226.05 million. These distributors employed more than 1,250 people in 2017. • In all, 22 U.S. states and one Canadian province (Ontario) were headquarters to at least one promotional products distributor in the Top 50—identical numbers to last year, despite six new distributors appearing on this year's list. Ohio led the way with six distributors calling it home, while Illinois had five. Ten other states appeared at least two times on the list, leaving 10 states that had a single distributor. • Once again, all four major regions of the U.S. had at least one distributor on the list. The midwest accounted for 42 percent of all Top 50 distributors, with 21 distributors in seven states. The south and northeast each had six states represented, but the south had more distributors with 12 to the northeast's eight. Just three western states appeared on the list, but their total of nine distributors was one more than the northeast's. • In 2017, the Top 50 distributors employed more than 15,000 people. Taylor Communications led the way with 5,000 employees, while Discountmugs.com and American Solutions for business each employed more than 1,000. Of the Top 50, the promotional products distributor with the smallest staff was e Group Inc. at 30 employees. Thirty-two of the Top 50 distributors had employee counts in the triple digits or greater. Original story published in Promo Marketing.